Accents :: Beds ::	Benches :: Chairs :: Coffee Tables :: Desks :: Dining Tables :: Lighting :: Sideboards :: Stools & Side Tables (Porcelains) :: Storage :: Sale! Brancusi’s work sent Tucker around the world in search of pure form, one that connects our hearts and minds to an essential organic. 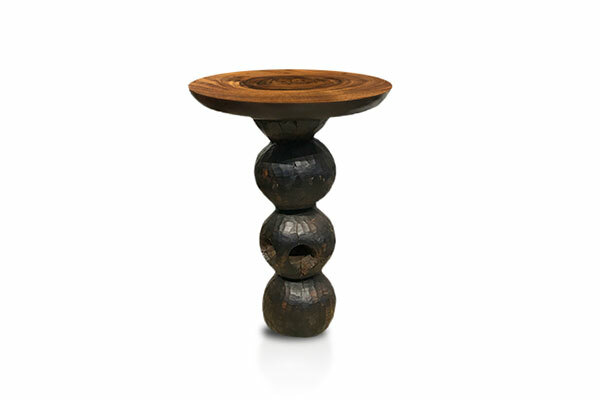 In celebration of Brancusi’s first show at the first Armory Show in 1913, the Snaka Waka Sidetable was formed. The Bamun carvers of Cameroon saw these and called them Snaka-Waka or snake walking in West African Pidgin English. The base is hand carved in West Africa using centuries old techniques, from the branches of the same coffee shade trees used to make the African carved stools. By using every part of the tree, the Snaka Wakas tell the story of sustainability. Custom finishes, sizes and configurations are available upon request. Typical lead-time is 6-8 weeks. Rush lead-times are available with a 15% upcharge to the order.